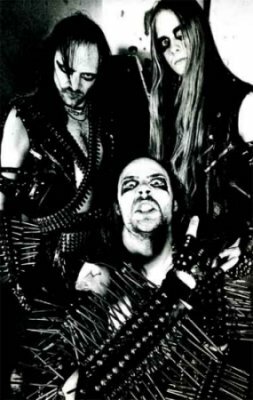 NIFELHEIM was formed in 1990 by TYRANT (bestial holocaust bass/guitar), DEMON (pounding disaster drums) and HELLBUTCHER (death vomit vocals). Soon they were also joined by guitarist MORBID SLAUGHTER. Around New Years 92/93 the band made their first recording and released the legendary landmark of metal - "UNHOLY DEATH DEMO". Reviewers were shocked ! NIFELHEIM delivered music unheard of since the glory days of VENOM, HELLHAMMER, BATHORY and early MAYHEM. Great reviews in mags and a massive underground word of mouth got the record labels interested. The band signed with Necropolis Records and in 1994, after kicking out MORBID SLAUGHTER they entered STUDIO FREDMAN to record their self titled debut album. The band is still banned from that studio... John Zweetsloot and Jon Nodtveidt from DISSECTION joined in to play guitar on the album that thoroughly crushed all competition. 1996 saw the band record a VULCANO-cover (featuring GOAT ex SATANIZED) on vocals for the HEADBANGER'S AGAINST DISCO 7" series as well as participate on the GUMMO movie soundtrack released by Polygram/London records. In 1997 they recorded their second album - THE DEVIL'S FORCE. Once again a devastating blow to everything wimpy in the metal scene and once again with help by John & Jon. Of course it was greeted with great reviews worldwide, as NIFELHEIM once again showed how Black metal was (and still is for that matter) supposed to be played! When the time had come to record a new album, NIFELHEIM discovered they had outgrown current label Necropolis Records, and therefore chose to go their own way, to get get a record company that could handle their demands in their evergoing mission to conquer the world. After spending time out to write new songs, record tracks for Bathory and Motorhead tributes, look for a drummer, the band returned to the studio in March 2000 to work on their third release - SERVANTS OF DARKNESS on new record label BLACK SUN RECORDS. Their most brilliant piece of work to date! In May 2001 the band finally got a full line up and played their first gig ever as headliners at the 2heavy4you festival in Sweden. Since then NIFELHEIM have done a couple of deadly concerts in Europe to spread Total death!! !